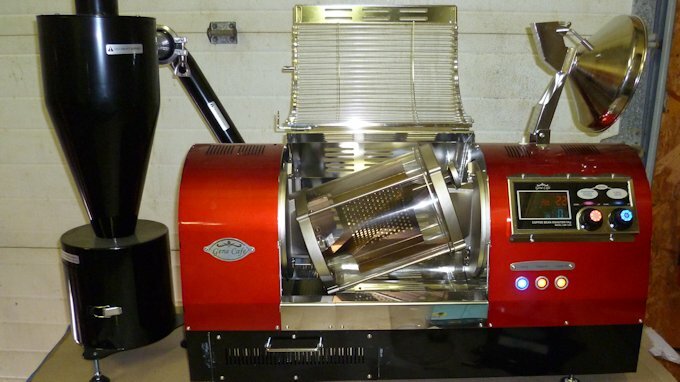 A question we get here at Burman Coffee a lot is: What’s the difference in processing methods? How does it effect the flavor of the beans? We’ll give a brief overview of the processing methods here, but checkout our article on a more in-depth discussion on green coffee beans and the different processes. This is the traditional way of preparing coffee beans for market and is the preferred method for many origins. Ripe cherries are spread on the ground in the sun. When the fruit is dry, it’s pounded and winnowed to separate the beans away from the dried fruit and hulls. Then they’re then graded, weighed and bagged. Natural beans generally are varied in color and shape. Machinery is commonly used to hull, separate and clean the dried beans. Natural coffees exhibit heavier body and flavor profiles with deeper-toned and more varied fruit, chocolate, spice and savory notes than the same beans prepared by the washed method. Natural coffees tend to have more chaff when roasting. Washed processing has 2 stages. The first “wet milling” stage starts with several washing and brushing cycles to separate the sweet pulp completely from the hull encasing coffee beans known as ‘parchment’. Next, the cleaned parchment soaks in concrete pools for several hours. They are then dried. In the second “dry milling” stage, the beans pass through a series of machines. They’re hulled and de-chaffed, graded by high-speed sorters to regularize size, color and/or density. The extremely consistent size, shape, color and flavor of beans processed by the washed method facilitates larger batch sizes and longer, darker roasting. In the cup, washed coffees exhibit bright, clean flavor and aroma, with notes of fruit, citrus, floral and spice. Washed coffees have light to medium-heavy body, and provide a blend’s crisp, vital first impression. A hybrid process used in Indonesia, Brazil and other origins with abundant water. It is used to improve the flavor and physical consistency of Natural coffees and is used mainly for Specialty-grade beans due to its higher expense. The process begins with removal of the outer cherry using wet pulping machines. The beans, still coated with sweet pulp, are ‘rested’ – cured for up to a day to develop the characteristic ‘Natural’ flavor profile. The pulp is again rinsed and the parchment coffee, still with traces of pulp, is fully sun-dried. Grading, weighing and bagging are accomplished in mechanized dry mills similar to those used in wet processing. By gently removing most of the fruit before drying, controlling the amount of pulp contact during drying, then using mechanized dry milling – coffee flavor and physical consistency is greatly improved. The beans retain the same flavor and body as Natural process coffees. Excellent improvements to your website. More friendly to peruse and accesswith handheld devices—using my phoneme now— it only invites the buyer to return again.